Until then, I have another really simple, yet kinda fun re-purposing project. 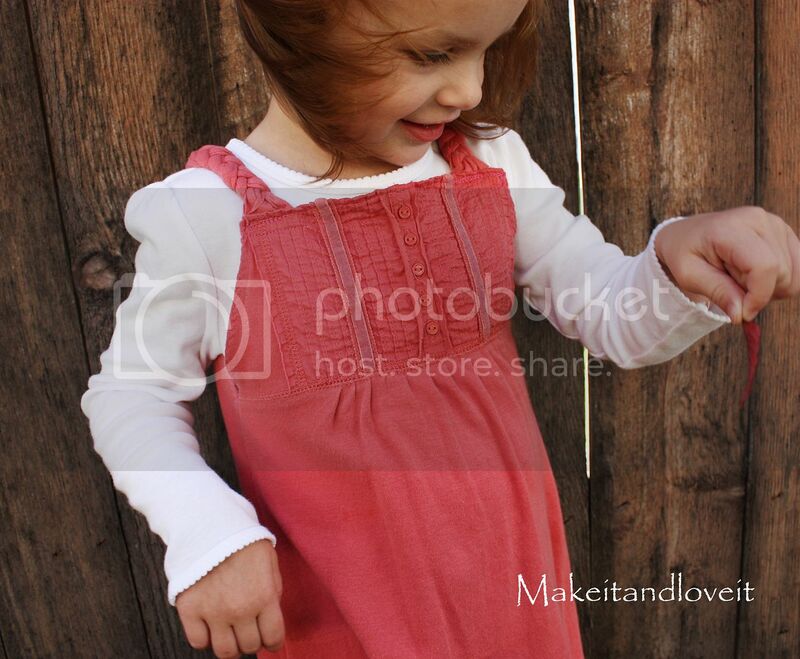 Turn one of your longer shirts into a sweet little dress for a little girl. And notice those braided shoulder straps…..
Nice and easy way to spruce up your project a bit. Start out by finding a longer shirt…..and maybe one that has a bit of a gather in the center. Works well for adding fullness to the dress. Also, try and find an old shirt that has some sort of detail in the center…….that will make this dress extremely simple to make, and quick. Now you’ll hem along the top edge and the arm hole openings. Do this to the front and back pieces. Now you’ll sew along the edges of the dress with right sides together. Now, using the material from the sleeves, cut 6 strips of fabric that are about 1 inch wide. Group them into sets of 3 and then sew each set of 3 together at one end. Decide how long you’ll need the shoulder straps to be (varies with each child) and then start braiding the pieces together…..
…..and then sew at the other end once you’ve reached your desired length. Then attach your braided shoulder straps. **Edited to add: I have had a few inquiries about the flower in my daughter’s hair. I make them for so many re-purposed things lately….I just forgot to add it to this post for any new readers. Oops. You can find the same flower included with a tutorial here. I just added a button to the middle and put it on a clip. Easy. I love it!!! I'm going to have to try the braided strap idea…awesome! very cute! love your idea! So cute. I love the braided straps. wow! even I could do that! So cute! One thing I wanted to add- I live in AZ and at Savers thrift store weekly on Monday they have .99 day for certain colored tags. Repurposing can be so fun when you find a cute item at Savers and you love the fabric print,design, etc, but it doesn't quite work. No matter- Just repurpose! Keep up the great ideas! Muito útil, pois você soube aproveitar a roupa que por uma mancha nas mangas poderia ter sido encostada. Mais fofa ainda é a menininha! Very cute, and I have a shirt that looks very similar to yours that I never wear. Perfect! How much do you cut off of the sides, below the arm holes? NO WAY! I just put two of those same exactly looking shirts in a bag to go to the DI! Gotta go dig them out. Thanks for the inspiration! How cute! I had a maternity shirt that looked just like that but brown! I'll have to try this one day with it! :) Thanks for the great ideas! Love this idea. Do you have another post that tells how to make the flower in your daughters hair. I am wanting to make some to put on a skirt I repurposed for my little girl. I just added a button to the middle and put it on a clip. I love it! I wish you lived near me, I'd love it if you hosted live classes and showed off various projects that you've done. Oh that's pretty! I love the style of shirt you used to repurpose, I have lots of those laying around. I'll be linking. I have a shirt just like this. Maybe I'll use it to do this someday! Thanks for this!! I'm linking this post to my blog for future reference. Totally cute! 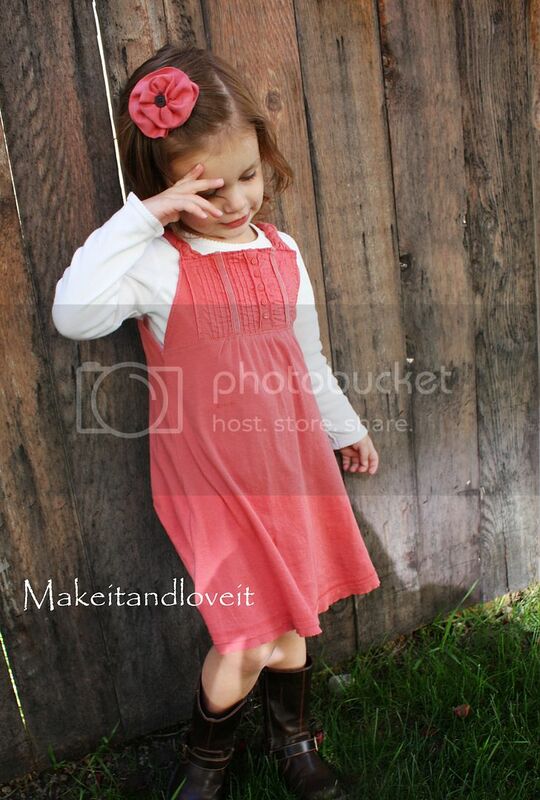 I can't wait till my little girl is a slight bit older to get her into some of these cute ideas! Oh, I WILL be doing this one.